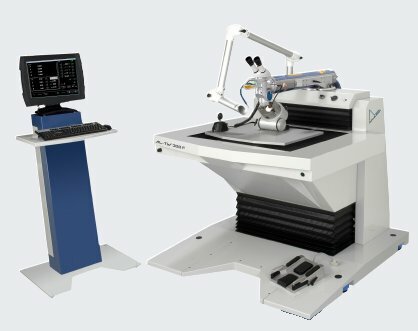 The Alpha Laser AL-TW work bench, has a very stable work bench to allow you to weld large pieces without limiting your workspace. It’s suitable for build-up welding, small repairs, serial production of housing parts, medical technology components or sensors, steel or aluminium. The AL-TW can be equipped with laser sources from 300 to 900 watts. The laser source is integrated into the work bench. With the modular device concept, you can use a wide range of objectives and focal lengths, optimally adapted to your special welding jobs. The lasers and movement system are easily operated from an intuitive touch screen on the side console. You can choose manual welding with the quick reacting joystick, semi-automatic or automatic welding with WINLaserNC software. During welding, work pieces are precisely moved on the work bench's three linear axes. The vertical Z-axis can lift work pieces of up to 450 kg. There is also an optional rotation axis for turning the work pieces.